Description: BriskBard is the new web browser for Windows that simplifies many of the most common tasks in Internet integrating in one program a web browser, an email client, a media player, a news aggregator, a file transfer client, a newsgroups reader, a contact manager, instant messaging, and several web developer tools. Description: CafeTimePro converts a desktop computer into a secure Internet Station or Kiosk. Complete Timing of application and/or Internet usage and terminal security included. Now with CafeShop POS for Internet Cafes (Free!). Some of the features included are: Simple Interface, Multiple Languages, Timers, Security, Variable or fixed rates, Prepay or Cash or Acceptor ready Transaction Logging, Remote Reporting. Description: DustyNet is a simple and easy to use web browser. It is lightweight and standalone so can you run direct from a single executable file and even from a USB stick. 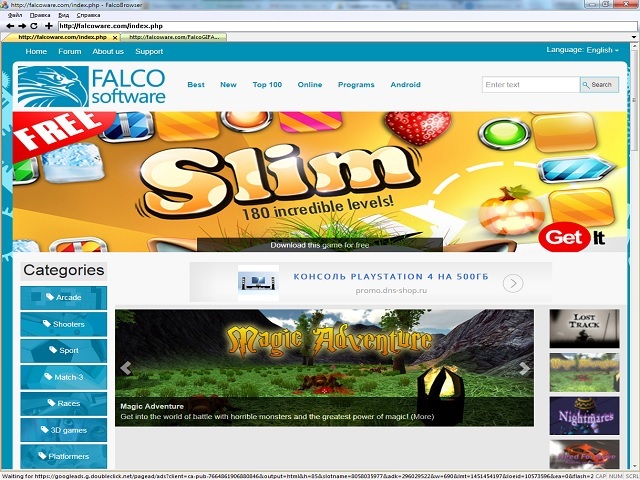 Description: Falco Browser is striking in its simplicity and efficiency. It incorporates an optional free proxy and optimal search engine that allows you to go to all the famous torrent trackers. This program is quite handy and easy to use. Give a try, you'll be glad you did! Description: PRIVATE BROWSING MODE Globus is dedicated to protecting your privacy so no one can track your Browsing history. SPEEDY By Blocking tracking scripts and ads GLOBUS loads webpages as much as 25% faster than other browsers. SCAN ALWAYS ON Every tab is a separate process so that you enjoy exceptional security. SEARCH PROTECTION Globus is powered by chromium for amazing performance and rendering. Description: Google Chrome is a browser that combines a minimal design with sophisticated technology to make the Web faster, safer, and easier. Use one box for everything--type in the address bar and get suggestions for both search and Web pages. Thumbnails of your top sites let you access your favorite pages instantly with lightning speed from any new tab. Desktop shortcuts allow you to launch your favorite Web apps straight from your desktop. Description: Open handy and popular websites on different devices without bookmark imports.